That guy up there leaning off the speaker? 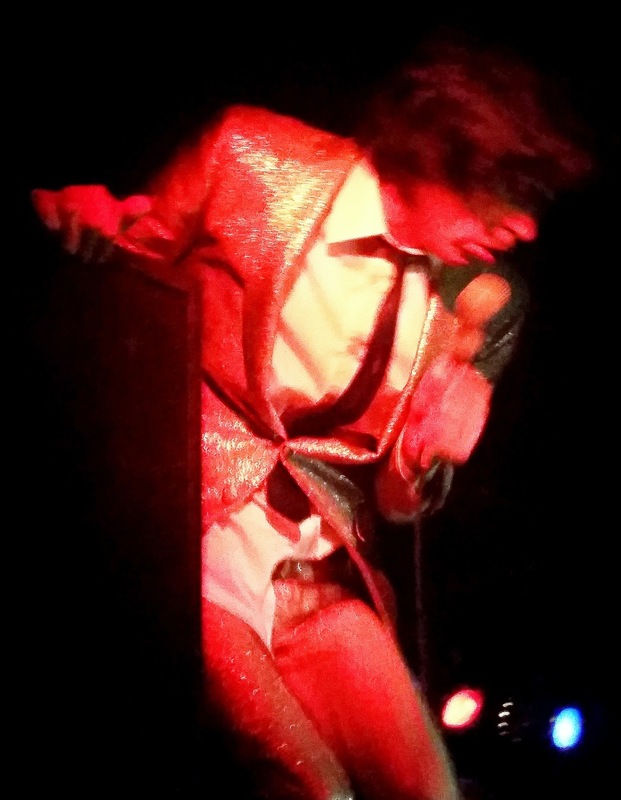 That cat is Ian F. Svenonius, in case you didn't know. He was once front-man of The Nation of Ulysses on Dischord, and leader of The Make-Up (recently revived from the dead for a series of live shows, that pic from the D.C. one last month), and he's also the singer for Chain and The Gang as well. The Chain, like The Make-Up, have returned for some more time in the public eye. The reason? The release of new record, Best Of Crime Rock, out this Friday on In The Red Records. In spite of what you might think 'cause of that title, the release is not a best of comp., in the purest sense. What it is is an exploration of the band's back-catalog and a re-casting of so many classic songs with the force of the current line-up of the band behind them. Of course, there are some legitimately "new" tunes here, like the Standells strut "The Logic Of Night", but it's the revitalized cuts, like the pounding "Devitalize", that showcase the formidable strengths of this act. 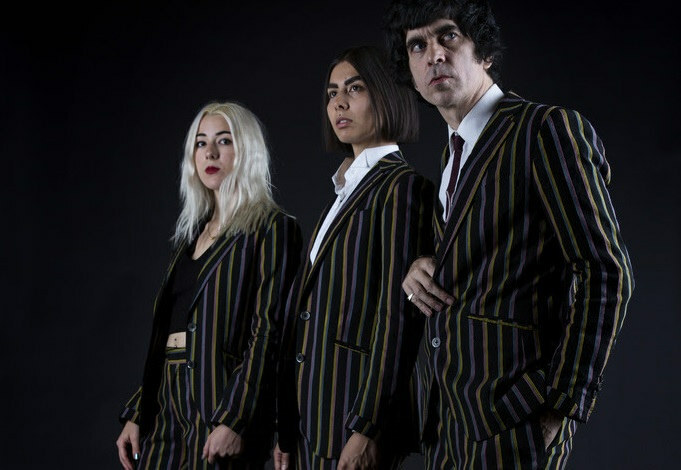 The line-up here -- Ian F. Svenonius on vocals and rabble-rousing, Francy Graham on guitars and such, Anna Nasty on bass and strategy, and Mark Cisneros on drums and things -- tackles these songs with a mixture of abandon and confidence. For a cat who's such an amazing band-leader, Ian could be forgiven for sticking to just one outfit but he clearly feels affection for the sort of tunes on offer here, enough so that one can see the difference in mission between The Make-Up and Chain and the Gang, for you newbies out there. Stuff like "I See Progress" sees this act firing on all cylinders, to use an overused expression, with bass/guitar/drums/vocals purring with a sinister intent, Sixties slink with free jazz underpinnings. Elsewhere, the hard bop indie-pop of "Free Will" percolates with a real sense of fun, a looser take on the original from 2012's In Cold Blood, while "Why Not? ", from 2011's Music's Not For Everyone, is here trotted around the track in a quick saunter, the Nasty bass and Francy riffs dueling it out under Ian's easy vocal performance. On the down-tempo "What Is A Dollar? ", the original number, from 2009's Down With Liberty... Up With Chains!, has been stretched out a bit to allow a looser take, the players here having a go at working some jazzy hooks into the cut, while "Certain Kinds Of Trash", from 2012's In Cold Blood, has been tightened up into a sort of take on early Bad Seeds. While Chain and The Gang lack the arty lugubriousness of that Nick Cave-fronted crew when tackling stuff like this, they are much better at infusing this kind of thing with a lot of wit and charm. One gets the sense that Ian doesn't necessarily take himself too seriously...even if he clearly is very serious about what he's doing here. A good case in point is "Deathbed Confession" which here seems much better and more vital than even the original. Stationed at the end of Best Of Crime Rock, this version of the number is haunting, surprisingly stark, and just heavy enough to signal another shade on this group's palette. Built over a live vocals-and-piano-take with overdubs from various guests, including local D.C. legend, DJ Baby Alcatraz (Alyssa Bell) on backing vocals, the song is sublime here. And it is pretty good proof of why there's no shame in the band re-recording the "hits" from their back-catalog, especially if the results are gonna be this good, this essential, and this subtly incendiary. So, what are we to make of Best Of Crime Rock then, in total? On paper, it seems a naff idea. Frankly, if it was any other band, I'd run when I heard that the band was re-recording their own back-catalog. Here, in the hands of these players, my feeling is different. What this is is perhaps the tightest live line-up of Chain and The Gang re-taking these cuts from the past in a largely-successful attempt to show how gosh-darn with it this group is now. The current version of Chain and The Gang now owns these numbers in every sense of the word. The tunes have been been retrieved, "stolen" from their younger selves, as it were, and recast as lost classics, the kind we knew and maybe didn't know well enough. Could this be the only Chain and The Gang record you need to own? Well, that's a bit unfair considering the expansive genius of Ian F. Svenonius; it remains the sort of intellect one wants to follow on any release, at any time. That said, is this as fine a distillation of one Ian-fronted project as one is likely to encounter? Yeah, yeah it is. The heart of Chain and The Gang beats here, under the hood of this supple beast. Four players in cahoots, committing the sort of transgressions against the boring norms and conventions of indie-pop in order to rescue us from ennui. Liberate us brothers and sisters. Bring it down Brother Ian! Best of Crime Rock is out on Friday via In The Red Records. There are many ways to follow the adventures of Chain and The Gang including the band's Facebook page, and their Bandcamp page for the earlier releases.